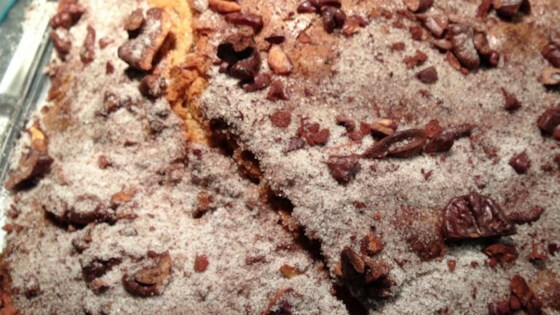 "A delicious, moist coffee cake from Eastern Europe. It's been in the family for generations and is everyone's favorite when Aunt Martha or Mama makes it." Preheat an oven to 350 degrees F (175 degrees C). Grease a 9x5-inch loaf pan. Combine flour, baking powder, baking soda, and salt in a bowl. Beat the butter and 1 1/2 cups of sugar with an electric mixer in a large bowl until light and fluffy. The mixture should be noticeably lighter in color. Add the room-temperature eggs one at a time, allowing each egg to blend into the butter mixture before adding the next. Beat in the vanilla with the last egg. Pour in the flour mixture alternately with the sour cream, mixing until just incorporated. Mix walnuts, 3/4 cup of sugar, cinnamon, and nutmeg in a bowl. Fold half of the walnut mixture into the batter; mixing just enough to evenly combine. Pour the batter into the prepared pan, then sprinkle the remaining walnut mixture on top. This dense, moist cake is easy to assemble and perfect with coffee.